Nebula can be defined as interstellar clouds that are made not of water vapors but of plasma, hydrogen, helium and dust. They are usually formed by a gravitational collapse of gases in the interstellar medium. They may stretch more than hundreds of light years across. They are sometimes referred to as “Star Nurseries” because stars form inside of them. The Boomerang Nebula is the coolest place in our universe that naturally exists. It was observed in 1980 for the first time using an Anglo-Australian telescope. Dark nebulae are the interstellar clouds so dense that they block any light from background stars. It is estimated by scientists that in about 5 billion years from now, our Sun will also become a nebula. Orion nebula is the closest to earth at a distance of 1,300 light years away from us. An emission nebula is formed when ionized gases emit a variety of colors, most often the result of a nearby hot star. A planetary nebula is made up of glowing and expanding ionized gases. Some nebulae can be seen in the night sky with the naked eye. Nebulae outside the Milky Way are known as extra-galactic nebulae. Diffuse Nebulae are the ones that spread out and do not have well-defined boundaries. Reflection Nebulae do not emit their own light. They only reflect the light from the nearby stars. Declan, Tobin. " 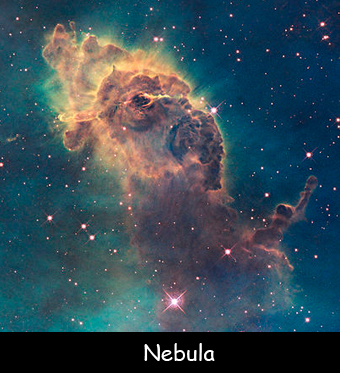 Fun Facts for Kids about Nebula ." Easy Science for Kids, Apr 2019. Web. 25 Apr 2019. < https://easyscienceforkids.com/nebula-facts/ >.